When I was a teen, I was really into Iron Chef, a competitive Japanese cooking show which might be viewed as the forefather of most of the Food Network’s current lineup. “Food Wars: Shokugeki no Soma” is another descendant. An anime based on manga by Yuto Tsukuda and Shun Saeki, it follows the adventures of teenaged hero Yukihira Soma through Japan’s most prestigious and rigorous cooking school. Soma is the son of a competitive and mysterious diner owner, and he’s been cooking since he was a child. At first, he looks down the other students, who’ve ‘never served a customer before,’ but as the series goes along, he learns a lot about cooking through competing with them. Shokugeki no Soma falls in line with many of the tropes associated with anime aimed at teenage boys. There are lots of nonsensical rivalries, training, and challenges to overcome while forthrightly contemplating philosophical points. And also plenty of fan service. These are certainly the first chef’s jackets that I’ve ever seen with cleavage. But even the fan service has its own goofy charm. The series is constantly searching for new ways to express culinary language visually. These range from a group of people eating a pork-roast so good their clothes explode to a panel of judges piloting a lobster rocket into space. 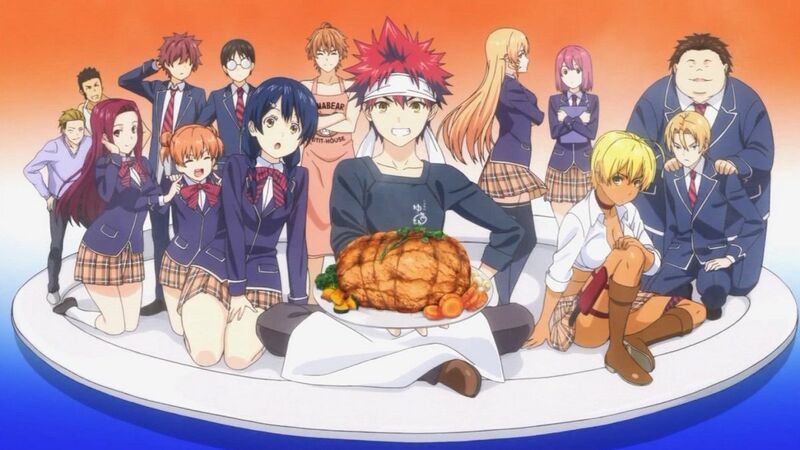 The first season of Food Wars: Shokugeki no Soma is currently streaming online at Crunchyroll, and is coming to DVD. While the show ends at a bit of a cliffhanger, and a second season has yet to be announced, this is an excellent series for foodies and anime fans alike. I’d like to give a hat tip to Jason Banks of the Talk Nerdy To Me podcast for the recommendation. If you enjoyed this article, please share it! For exclusive content and podcasts, sign up for my Patreon feed!